Funny Crazy Hillbilly Music Cartoon Original Funny Crazy Hillbilly Music Cartoon - "Don't Swat A Fly"
Original Funny Crazy Hillbilly Music Cartoon featuring a Hillbilly father giving his son some really funny advice and learn why you don't swat a fly! CLICK HERE for Free Original Lyrics to "DON'T SWAT A FLY"
The photo on your driver's licence includes your dog. You think a valid defense is "He needed Killin' ". Your kids have gun racks on their bicycles. Your dog and your wallet both have chains on them. Don't Swat a Fly is a Funny Crazy Hillbilly Music Cartoon featuring a Hillbilly father giving his son some really stupid advice. Redneck humor at it's best with some good solid advice such as don't swat a fly that's landed on a pitbull and don't ever play with your new chainsaw in the tub! Good sound advice to get you through the day without getting killed. 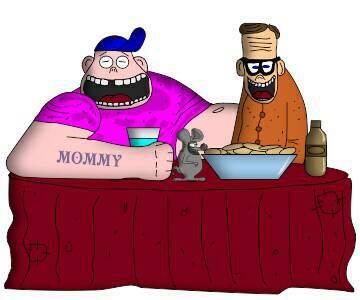 So if you like Lots of Redneck Jokes then watch this Crazy Animated Hillbilly Cartoon and remember.............Don't ever date your father's cousin's sister...............Just in case! Fun, Crazy, Demented, Insane and Nuts - "Don't Swat A Fly"
Why do flies chase garbage trucks?